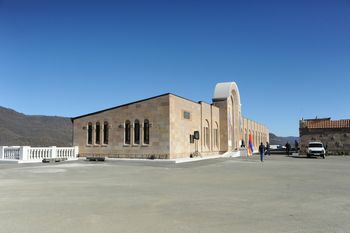 On November 21 has taken place the “Mesrop Mashtots Institute of Ancient Manuscripts – Gandzasar” scientific-cultural center’s opening ceremony by participation of the President of the Republic of Armenia Serzh Sargsyan and the President of Nagorno Karabakh Republic Bako Sahakyan, government officials, clergy and representatives of the scientific community. “Gandzasar” scientific-cultural center as a branch of Mashtots Matenadaran in Artsakh has two basic sections: a department of scientific researches and a museum complex, where are shown more than hundred manuscripts written in the provinces of Artsakh and Syunik of historical Armenia, originals and copies of the unique documents related to the history of Artsakh, as well as ancient books and also, by historical circumstances, manuscripts redeemed or brought from another places holding in Artsakh’s churches and monasteries. The first time in the history Artsakh manuscripts collected from the whole world under the same floor and made big and useful opportunity for scientific different researches. 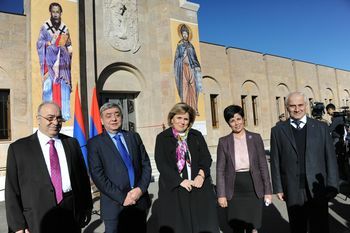 The building of Matenadaran being constructed in the neighborhood of the Gandzasar monastic complex was renovated through the funds provided by “Pyunik” All-Armenian Fund for the Human Resources Development with generous patronage of co-presidents Gabriel Chemperchyan and Levon Sargsyan. The branch is a structural component of the Mesrop Mashtots Matenadaran, and its full-fledged functioning will be ensured through the engagement of Matenadaran’s scientific and technological potential. “This depository is also the symbol of the unity of Armenia”, - said in his speech in the opening ceremony, Minister of Culture and Youth Affairs of the Nagorno Karabakh Republic NARINE AGHABALYAN. “The initiative of creation of Artsakh’s Matenadaran from an idea until realization was under the patronage of the Presidents of the two Armenian states, which witnesses the nationwide significance. The project of Artsakh’s Matenadaran was fulfilled thanks to 'Pyunik' Charitable Foundation, which is famous for its numerous philanthropies in Artsakh. Happily for all, the series of tutelary best examples of our history and our national sponsors increased by one, in the face of Gabriel Chemperchyan. This patriotic idea became a reality due to personal dedication of Mashtots Matenadaran’s Director Hrachya Tamrazyan and industriousness of the whole team of Matenadaran, the work done with love and willing and interests, and also with joint efforts and enthusiasm of the Artsakh Ministry of Urban Development (head of the construction company Arkady Tsatryan, architect Valeri Hayrapetyan), architect and builders. This Matenadaran is our dignity, conclusive evidence of our guiding values, our message to the world in the Armenian Genocide’s 100th anniversary. This subsidiary of Mashtots Matenadaran’s main depository of manuscripts in Artsakh is reestablishment of our invincible spirit and our determined will to be the passenger of eternal march, our message to the future generations with the sword, cursive and pen”. 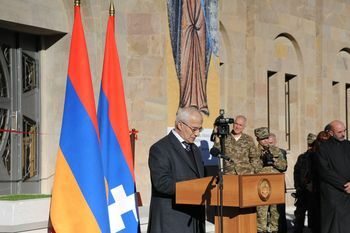 By presenting the incentives of education and culture of creation of Artsakh’s Matenadaran, Mashtots Matenadaran’s Director HRACHYA TAMRAZYAN specially highlighted the fact that “The Armenian statehood has always been anchored on the culture and the culture on the statehood, their inseparably link, the harmony shaped the human mentality by pushing her to the spiritual heroism on the battlefield and in composing works”. “Dedicated to 100th anniversary of the Armenian Genocide, we emphasize our rise, revival, creation advice, and celebrate it by building the Matenadaran and heralding to the whole world, that was created another repository of human memory. This is a sign of our strength, our great challenge of assembly, and our message to the future generations, - he said. During the history of Armenia, according to H. Tamrazyan, the exceptional role of Artsakh is primarily due to the loss of Armenia’s statehood, after which it has maintained its independent existence for centuries, which gave him the opportunity for naturally development. Since the days of constitution adopted by King Vachagan III the Pious until the beginning of the 19th century, Artsakh was the birthplace of protection of the Armenian statehood. Educational and spiritual spaces with natural process of development have promoted and stimulated the creation of matenadarans in monastic institutions, where gathered hundreds of manuscripts, and in addition to the liturgical collections were also copied Armenian independent and translated works of various genres of Medieval Armenian, formed a unique school of miniature painting, that maintained regular contact with similar centers and schools of Armenia’s other provinces. During this period were created gems of Armenian book art and miniature painting, which were ordered mainly by representatives of the religious high class and prominent government houses”. “One of the historical missions of Artsakh, - said H. Tamrazyan, is that here for centuries have been kept many treasures of Armenian culture and book art that have been redeemed by the Armenian armed forces from foreign plunderers. These treasures of manuscript were the prototypes for local painters and miniaturists. We have tried to present this unique process of historical-cultural development in our exhibitions and studies dedicated to the Artsakh’s book art and miniature painting, medieval exclusive documents and old printed books, a process that provides a wealthy material for new reporting and study, witnessing about the historical and political progress, developments and cultural revival, and this history needs to be studied by separate centers, schools and authors. And for those studies, as well as for development of general Armenian Studies will become a powerful impetus the “Mesrop Mashtots Institute of Ancient Manuscripts – Gandzasar” scientific cultural center with its library, modern logistics arsenal, hall, researchers, thematic exhibitions, annual international conferences, in a word, with its fullest scientific cultural life, as a whole unity with Mashtots Matenadaran, by strengthening its potential, depth and spatial areas. This exhibition of manuscripts and historical documents created in Artsakh is a proof with its political context of Armenians in Artsakh, and therefore everyone who visits Gandzasar Monastery will have an opportunity to be acquainted with the role and significance of Artsakh in civilizations’ development”. 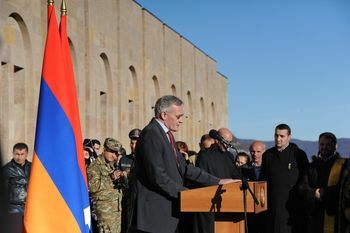 In his speech, the President of the National Academy of Sciences of the Republic of Armenia Radik Martirosyan highlighted the cooperation of new scientific-cultural center and scientific center opened in 2010 by support of institutes of the National Academy of Sciences of the Republic of Armenia in Artsakh, as the latter generally has inclination to the natural sciences , and the creation of Artsakh’s Matenadaran gives an opportunity to develop in Artsakh also the humanitarian sciences and Armenian studies in general. Professor of Oxford University, armenologist Theo MAARTEN VAN LINT noted that the creation of Gandzasar’s Matenadaran has international significance for the Armenians and Armenian Studies in general. “This initiative is a new beginning for the creation of positive relations, - he said. Artsakh has great traditions in the creation and preservation of Armenian manuscripts. In 10-14th centuries the unique school of miniature painting created and developed in Artsakh, and this school’s samples admire everybody with its original beauty. This holy place kept silence for a long time, where in the past worked laymen, rulers and clergy, and were made important decisions for Armenia’s history. As if it waited that the scriptoria and church again would be filled with spiritual songs and hot discussions. And that day came, the hymns are sounding in the church, the liturgy is being served, and now already in this holy environment will work the scientists. Prayer, thought and dialogue, which establish the faith, develop the culture and create the life. We all know that Gandzasar was the place of Catholicos and one of the most important centers of spiritual culture. Therefore it was not an uncultivated, but “And other fell on the ground, and sprang up, and bare fruit an hundredfold” (Luke 8:8). Gandzasar’s rich harvest shines again, and here, at this peak of Gandzasar it is appropriate to recall the words of the Savior, “Ye are the light of the world. A city that is set on an hill cannot be hid. Neither do men light a candle, and put it under a bushel, but on a candlestick; and it giveth light unto all that are in the house” (Mat. 5:14-15)”. The Director of the Department of Foreign Relations of Mother See of Holy Etchmiadzin, His Eminence, Archbishop Nathan Hovhannisian with the representatives of clergy offered the blessing of “Mesrop Mashtots Institute of Ancient Manuscripts – Gandzasar” scientific-cultural center, who transmitted the audience the patriarchal greetings and love of His Holiness Karekin II Catholicos, with the blessing to this worthy and happy occasion. “We are all on a sacred land that is mixed with our ancestors’ faith, with hope of our grandfathers, with our ancestors’ blood, with light of Mashtots, with faith martyrdom of holy St. Vrtanes - the grandson of St. Gregory the Illuminator, - said Archbishop Nathan, a place which name is talking about himself, Gandzasar, a place where the treasures of the soul, mind and faith of Armenians are accumulated and entered into the eternity. And today in Gandzasar is again opened the Matenadaran - one of its former glories. Matenadaran where is preserved the most important thing for the Armenians - the book, cursive and manuscript. And today is really a joy and jubilation not only for the Armenian country but also is merriment in the Armenian sky”. 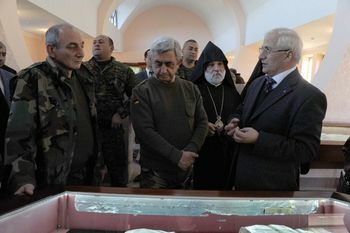 After the opening ceremony the President of the Republic of Armenia Serzh Sargsyan and the President of Nagorno Karabakh Republic Bako Sahakyan, presented officials and clergy toured in the newly opened museum halls and, then participated in the presentation “Scriptoria of Artsakh” album-study of Matenadaran’s researcher Tamar Minasyan.